Nary a vehicle competes with the 2017 Acura RDX when it comes to engine power and high-quality performance, making it one of our most popular models at Rallye Acura in Roslyn. 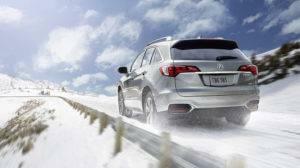 Not only does the new 2017 Acura RDX boast a powerful engine and your choice of front- or all-wheel drive, it’s one of the most efficient vehicles in its class and includes a range of driver assist features. See what we mean by reading on! The RDX runs on an aluminum alloy 3.5L 24-valve SOHC i-VTEC V6 engine, capable of an unbelievable 279 hp and 252 lb-ft of torque. Variable Cylinder Management keeps the RDX efficient, allowing it to run on as few as three cylinders to increase efficiency. It’s important for a new crossover to fit into the budget, and the 2017 Acura RDX performance specs come paired with some of the best fuel economy ratings in its class. These fuel economy numbers aren’t just good for the budget; the 2017 RDX has been labelled a ULEV-2 vehicle for its emissions status. But perhaps you want a bit more proof before you commit to your new RDX. We can help. Visit Rallye Acura today and take the new crossover out for a spin and discover the 2017 Acura RDX performance for yourself. You’ll find us at 1750 Northern Boulevard in Roslyn; call us at 516-508-9147 or reach out through our online form to learn more or schedule your test drive. We can’t wait to put you in the driver’s seat! *Based on 2017 EPA mileage ratings. Use for comparison purposes only. Your actual mileage will vary, depending on how you drive and maintain your vehicle, driving conditions, battery pack age/condition (hybrid only) and other factors.